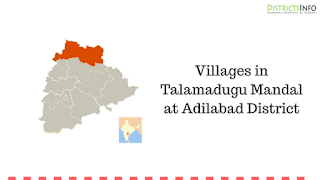 List of Villages in Talamadugu Mandal of Adilabad District: Talamadugu mandal is the mandal in Adilabad district of Telangana state. Talamadugu Mandal Head Quarters is Talamadugu town. It is located 16 KM towards west from District head quarters Adilabad. This Mandal is bounded by Tamsi Mandal towards North, Adilabad Mandal towards East, Gudihatnur Mandal towards South, Bazarhatnoor Mandal towards South. Read more about Adilabad district on Wikipedia. Also, you see districtsinfo for better details about these mandals in different districts of India. This is all about Villages in Talamadugu Mandal at Adilabad District. Also, you go for other mandals in Adilabad district. Get details about how to apply for PAN card in Telangana state. All the details including the procedure to apply, documents, etc.